Freezing greens the smart way! I started a lot of mustard plants this spring, because it grows really well in the demo garden (as long as we keep it under row cover), yields heavily, and is popular with the clients at Manna Food Center, where we donate produce. But I had more extra Red Giant and Purple Osaka plants than anticipated, which meant that a lot of them ended up in my own garden. I like mustard, but I’m inclined to mix it with other greens, and it needs frequent harvesting, so I end up freezing a lot of it. When we eat commercial frozen greens, which we often do in the winter, it’s easy to take as much as we need out of the bag, because each leaf (or cut piece of leaf) is separate from the rest. But when I put my steamed greens into a freezer bag, I ended up with a big lump that had to be thawed (and then used) all at once. This time I got smart, and once I’d washed the mustard, cut it into strips, and steamed it, I used tongs to lay it out in a single layer on a cookie sheet, and then stuck the sheet into the freezer for about ten minutes. This resulted in nice crisp half-frozen leaves, which I then put into a bag – and I’ve just checked, a day later, and the leaves are not in a lump but easily separable and convenient for future use. The bag’s also marked with the contents and date of freezing, an obvious and intelligent action that I have been known to forget in the past. Enjoy reading your fun posts – I enjoy reading about your experiments in both the garden and kitchen. 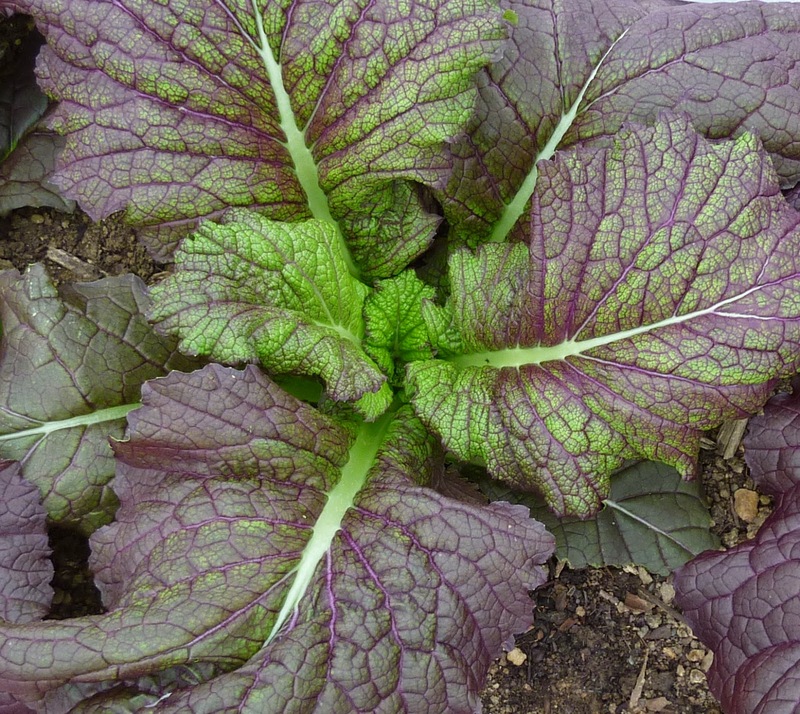 It's nice to read I'm not the only one who has had success freezing mustard greens. I like to chop and freeze them without steaming them – they stick together a bit, but doesn't take too much work to break off a clump. Glad to hear you enjoy the posts! I tend to throw frozen greens directly into the sauté pan, so I like them a bit pre-cooked and un-clumpy, but either would work. Thank you for this post. Somehow, I never thought about freezing mustard greens; I guess since I tend to grow them together with lettuce, it never even came to mind (plus I don't like soggy greens). However, I do have a lot of beautiful greens at the moment, way more than I can eat. I also have a feeling they will be bolting soon. I've even been adding some of the mustard that's in the mesclun mix I planted to the freezer-designated bunches, though most of it gets caught small enough for salads or stir-fries. This method should work fine for other greens too, though. Would this work for swiss chard or curly kale? I just have too much from my CSA and I don't want it to go to waste!